The Garden News Team are potting up bulbs for winter, planting delicious rhubarb and taking hibiscus cuttings to pass on a little charm in time for Christmas! This Week's Features: Sow super sweet peas now, it's time to get mulching and plant a mini cider orchard. Carol Klein celebrates the joy of autumn's abundant crops. Our Garden of the Week this week is a vast lawned area segregated into different sections, with surprises around every corner. 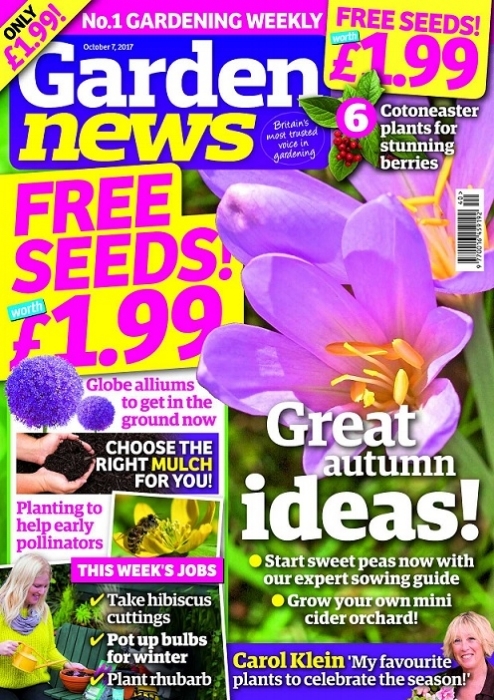 Garden News Expert Contributors: Neil Lucas delves into grasses for shady spots, whilst Graham Strong demonstrates how you can make your own autumn hot spots. Plus all our regular columnists.